The dipper-T water level meter can be conveniently converted to a multi functional instrument, not only able to measure static and falling head levels, but also to determine the length of casing and well depth. The water level sensing probe can be easily removed at the link connection and substituted with either the Well Casing Indicator Probe or Well Depth Indicator Probe. 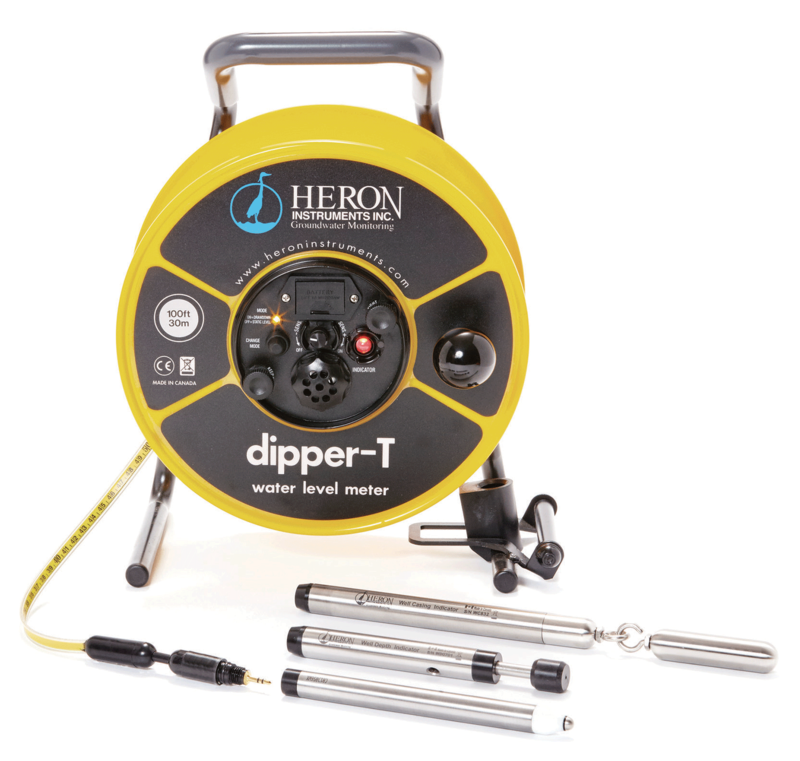 The FOUR FUNCTION capability of the dipper-T water level meter makes this unit an asset to groundwater professionals and rural property owners during the construction of new wells, maintaining wells or decommissioning abandoned wells. The Well Casing Indicator Probe is used to measure the depth of metal casing in wells and boreholes from two inches in diameter and upward. It works using magnetism; while the probe sits within the magnetic field of the steel casing, an auditory and visual signal is active. When the probe leaves the magnetic field the signal stops. Note the condition of the well for accurate readings. ♦ Available in 15 - 300 meter lengths. ♦ High tensile steel tape, jacketed with polyethylene, high break strength, stretch resistant. ♦ Static and DrawDown operating modes. ♦ Well Casing and Well Depth modes (requires purchase of probe accessories). ♦ Field replaceable, fully pressure/depth rated probes.